Fashion is an ever-changing industry with the latest trends and designs changing almost every day. For a designer to survive in this heavily competitive market, the key lies in predicting these changes before it becomes a trend. Moodboard Analytics, a Delhi-based AI startup does exactly this. Having realised the potential of technologies like artificial intelligence (AI) and machine learning (ML) in disrupting the industry, a young fashion-enthusiast decided to venture into the field without any trepidation. 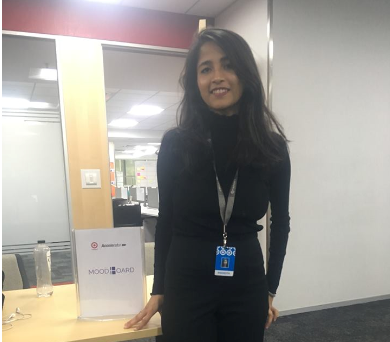 Anandita Bhuyan, a medical school drop-out was just 22 when she started Moodboard Analytics all by herself in 2018. With no prior experience or knowledge about the intricacies of AI and ML, Bhuyan says that she relied on her tech friends and other sources to know more about the technology and its jargons to make her vision of building an AI tool for fashion analytics come true. The platform leverages technologies like AI and combines it with computer vision and & Natural Entity Recognition tool to predict visually-driven analysis regarding trending colour patterns, design among other things for fashion designers. Having interned with a fashion retailer before, Bhuyan says that it was during a brief stint there that she realised the potential of the technology. “The retail supply chains have multiple elements comprising fashion designer, product creators, margins and inventory analyst who rely on numbers and statistics on a daily basis. While interning with the retailer, I noticed that there is a gap in this space which cater to the creative part of the fashion supply chain and that’s how the idea of Moodboard was born,” says Bhuyan. Even though they are based out of Bangalore, the platform is targetted at fashion designers based in North-American and European market, considered to be the hub for the development for the latest fashion trends. Though there are a number of startups working in this field, Bhuyan says that fashion analytics industry still hasn’t picked up any steam in India and continues to be at a nascent stage, “This is one among the primary reason for us to look overseas market,” Bhuyan says. However, she is quick to point out that the key players in India do acknowledge the potential of the technology and the industry is slowly embracing these technologies. “The demand for AI and data-powered solutions are growing as they are aware that if they don’t adapt to new technological solutions they will be obsolete within no time. But in terms of adaption, there is slow progress. Due to this, we are focusing on North-American and European market,” she added. AI and image recognition have been used at the core of the platform to provide visually-captivate insight. In order to make correct and accurate predictions, the back-end has been trained to streamline data to look for trends from online articles, blogs, celebrities and fashion influencers. Further, computer vision and text vision models are applied to draw precise data insights. Once the platform has been download by a designer, they can access a cloud-based tool that provides fashion insights in real-time. Further, Moodboard has a proprietary taxonomy of fashion and lifestyle attributes, that makes the difference in end output or insight the designers receive. “Fashion is very visually-oriented and abstract so, what we aim to do is to create an end-to-end product that is visual and intuitive. In order to achieve this AI, image recognition and computer vision have been leveraged on a large scale in our platform,” Bhuyan explains. While the startup is relatively young and it is yet to find a sound grounding in the European and North-American markets, it has made steady progress since its inception. After spending a lot of time in the fashion space it has become easier for the startup to gain valuable insight on the working of the retail industry, it has managed to tie-up with Canadian luxury retailer, lingerie and ready-to-wear apparel maker within this short time.